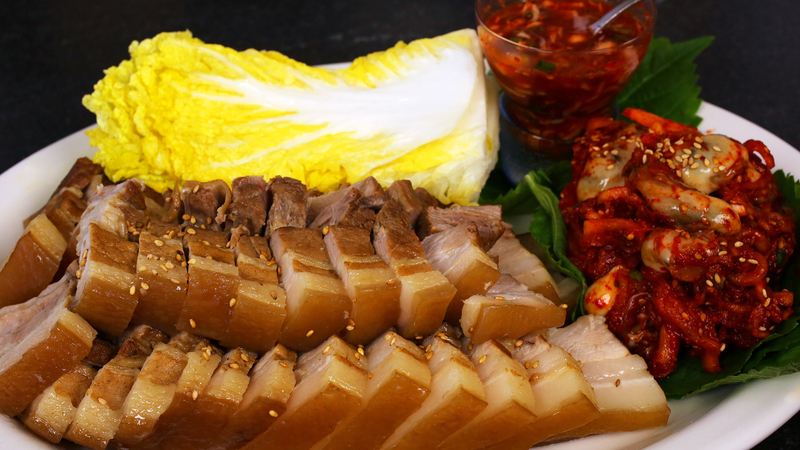 Today’s recipe is bo-ssam, a traditional Korean recipe that’s a pouch full of delicious stuff! It’s super-tender flavorful pork, hot red spicy oyster radish, and subtly flavored fermented shrimp wrapped in a crispy pickled cabbage leaf. It’s a dish that many of my readers and viewers have requested, and one of my favorites, too. My version is one that I’ve refined over the years, that took a totally unexpected turn when I lived in Missouri. The Korean community there held potluck parties regularly, and everybody brought their best dishes. 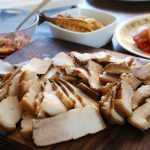 Once a lady brought her bo-ssam, and it had a rich brown color, unusual for boiled pork, and an irresistible, unplaceable porky flavor. I asked her how she did it, and she told me her secret: instant hazelnut coffee. I’ve been using her trick ever since. As it turns out, hazelnut coffee goes well with pork, and mixes well with all the other bo-ssam ingredients. This recipe is not easy: there are a lot of steps for each ingredient, and you need to take care of all of them. The cabbage needs to be turned over often, the oysters shouldn’t be squeezed, and the pork needs to be tended to while it boils. But the result is fantastic, and delicious. It’s also one of the recipes that made it into my cookbook. 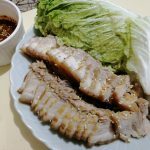 The word ssam literally means “wrapped” and refers to a tradition in Korean cuisine where small amounts of ingredients are wrapped in a larger ingredient (usually a vegetable, but not always) to create a single delicious morsel. 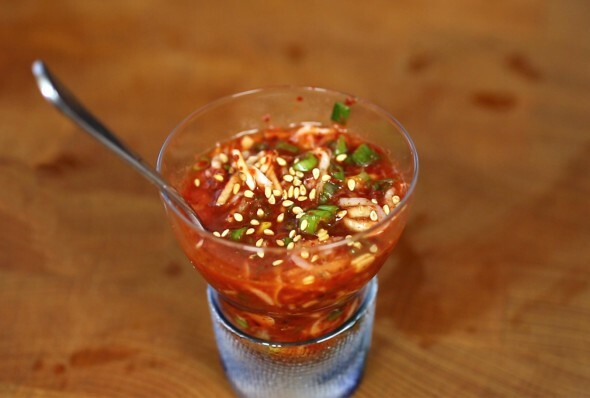 Some Koreans add ssamjang to the recipe, but it’s too salty for me. The shrimp sauce is unskippable, not only because it goes well with the pork, but it helps digest it well, too. If you are really pressed for time and need to leave something out, it can be the oyster salad and the pickled cabbage. 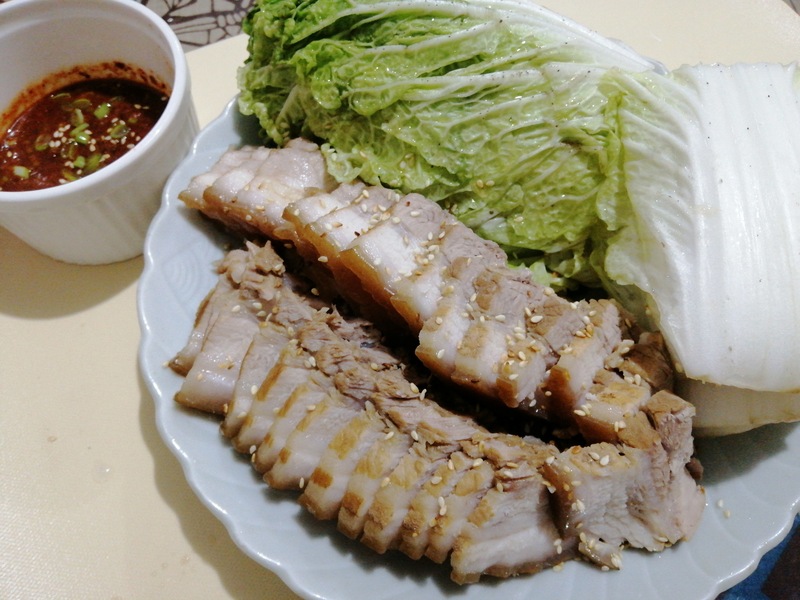 Just serve pork, shrimp sauce, kimchi and rice, and maybe some lettuce. The oyster radish salad in this recipe can stand on its own as a banchan (side dishes), even if you don’t make bo-ssam. Use 15-17 fresh shucked oysters if you can’t find frozen. Combine sugar, vinegar, salt, and water in a large bowl. Mix well until it turns into a clear pickle brine. Add the cabbage and mix well by hand. Let it sit for 15 minutes, then mix well and turn it over so the leaves pickle evenly. 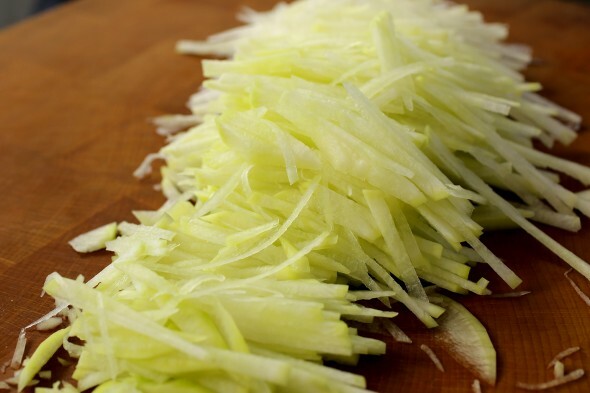 Repeat this every 10 to 15 minutes for 1 to 2 hours until the cabbage gets soft and withered. Squeeze out the excess water and refrigerate until ready to serve. Add the pork, onion, ginger, garlic, soy bean paste, brown sugar, hazelnut coffee powder, and the water to a large pot. Cover and cook for 1 hour over medium high heat. 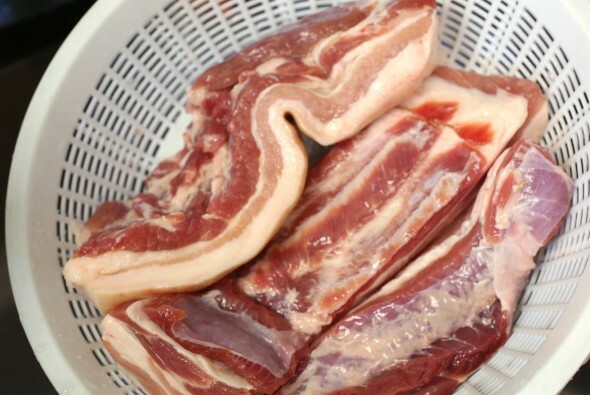 When it boils vigorously, turn the pork over with a wooden spoon or tongs. After 1 hour of boiling, turn down the heat to low and cook for another 15 minutes. Take out the cooked pork and let it cool down until ready to serve. Cut the radish into matchsticks and put them into a bowl. Mix with the salt and let it sit for 10 minutes. Squeeze out the excess water and put it back into a bowl. Take the oysters out of the fridge and wash and drain. Create a seasoning mixture by combining hot pepper flakes, fish sauce, sugar, garlic, and green onion in a bowl. Mix well with a wooden spoon. Add the seasoning mixture to the radish and mix well by hand. Add the oysters and mix it gently. Add the sesame seeds. Combine the fermented salted shrimp, sugar, hot pepper flakes, green onion, garlic, and water in a small bowl. Mix it well with a spoon. Sprinkle with sesame seeds. Slice the pork into 1/8 inch thick pieces. Put them on a large platter. Add the cabbage, spicy oyster radish salad, and shrimp sauce side by side nicely. Sprinkle with some sesame seeds and serve. Put a leaf of pickled cabbage on your palm (or on a small plate if it’s easier). Add a piece of pork to the leaf, as well as some oyster radish salad, and a tiny amount of shrimp sauce. You should make it small enough so that it will fit into your mouth all at once. Wrap the leaf into a small pouch and eat it whole. Go back to step 1, and modify the amount of each ingredient, as you like, or not. Posted on Saturday, May 9th, 2015 at 12:45 pm. Last updated on December 3, 2017. Posted March 17th, 2019 at 3:11 am | Log in to reply. Annyeonghaseyo! After watching this vid, I made this recipe of yours and it turned out pretty well. My husband loved it. He even told me that I can open my own resto hahah! I’m a fan of Korean foods and Maangchi :). Thank you for sharing your recipes and even your secret ingredients. 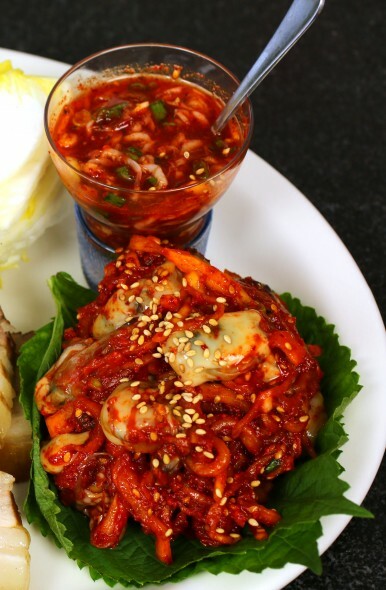 I am now sharing my version of bossam which I paired with deep fried gyoza, oyster radish salad and ripe kimchi. We also enjoyed the shrimp sauce dip. Posted March 18th, 2019 at 11:25 pm | Log in to reply. You are such a great cook! No wonder your husband said you can open your own restaurant! Happy cooking! Posted February 7th, 2019 at 5:39 am | Log in to reply. I was going to cook bossam this Saturday but my guests can’t come anymore. 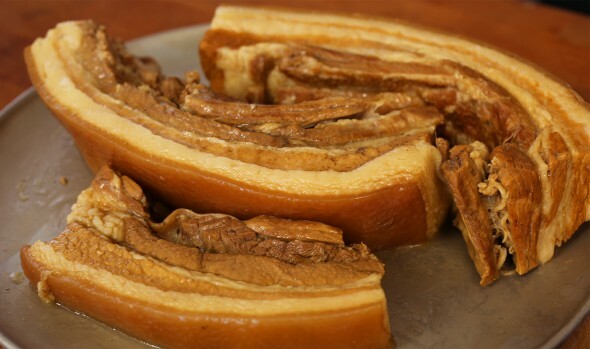 Do you think I can freeze the pork belly (2kg) and use it for bossam when we can reorganise our little party? Or should I just resign myself and eat it all this weekend? Is it ok to defrost and then cook the recipe? Many thanks!! Posted February 7th, 2019 at 7:29 pm | Log in to reply. No problem freezing it, raw or cooked. Yes; defrost it when you gather. No problem. Posted January 13th, 2019 at 1:13 am | Log in to reply. Hi Maangchi, I am a newbie here on your page but I have been a fan for years now. When it comes to Korean dishes, I always go to your Youtube channel. I always make food from your recipe and serve it to my friends. I am glad i have finally registered here. Thank you so much for being an inspiration. 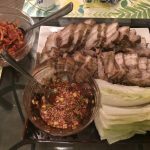 I made bossam based on your recipe. However, due to the absence of some ingredients, I tried to substitute whatever I have available. It still turned out well. For fermented shrimp, I used our local one called “ginamus” and since I don’t have hazelnut coffee, I used a strong version of one of the popular coffee brands here in Philippines. Posted January 13th, 2019 at 10:55 am | Log in to reply. Your bossam was cut very nicely and it looks awesome! Posted November 22nd, 2018 at 10:24 am | Log in to reply. 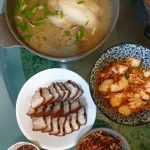 dear maangchi, i made bossam for dinner today at long last! i had it when i visited korea in april and i loved it so much. i didn’t have hazelnut coffee but i used regular instant coffee and it smelled sooooo delicious while cooking. my family loved it along with the oyster and radish salad ♡ i also made kimchi today so we had some fresh kimchi to go with it as i’ve heard it’s quite common to eat bossam with fresh kimchi! my mom made a big pot of samgyetang too. i wanted to know if there’s anything the broth that the meat is boiled in can be used for later? i know there’s coffee and other flavorings in it, but it still tasted quite nice hehe. Posted December 2nd, 2018 at 9:13 am | Log in to reply. Wow your bo-ssam and samgyetang table look amazing! Your whole family seems to be getting into Korean cooking these days. I throw away that broth because all the fat is there, but you can try using it for something. If it turns out good, let us know! Posted September 5th, 2018 at 12:19 am | Log in to reply. Posted September 5th, 2018 at 9:42 am | Log in to reply. You made this without skipping any ingredients. I’m so impressed! Posted September 5th, 2018 at 10:51 am | Log in to reply. Yes Maangchi. There’s a Korean grocery here in Houston, H-Mart. I bought all ingredients like what you’re using, pepper flakes, fermented shrimp, even the hazelnut coffee. I forgot the perilla leaves though. Posted March 11th, 2018 at 3:29 am | Log in to reply. I cannot find that brand hazelnut coffee anywhere in even the Korean grocery store here in Canada called H-Mart. Do you think I can use a different brand hazelnut instant coffee powder? Posted March 15th, 2018 at 9:02 am | Log in to reply. Yes, you can use a different brand, as long as it’s hazelnut flavor. I made bo-ssam last night, and I used this same hazelnut coffee that I’ve been using for three years, kept in the freezer! Good luck! 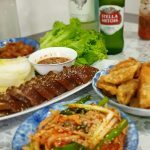 This recipe was originally posted on May 9, 2015 at 12:45 pm by Maangchi. It was last updated on December 3, 2017. The video was watched 3,341,784 times on YouTube & has 37,020 likes!